I was excited to pick up this historical by Michelle Griep, and when I did, life became too busy to finish it! Lucky for me, we recently had a holiday weekend:) Here's a short blurb, and we'll chat on the other side! Dover, England, 1808: Officer Alexander Moore goes undercover as a gambling gentleman to expose a high-stakes plot against the king—and he’s a master of disguise, for Johanna Langley believes him to be quite the rogue. . .until she can no longer fight against his unrelenting charm. All Johanna wants is to keep the family inn afloat, but when the rent and the hearth payment are due at the same time, where will she find the extra funds? If she doesn’t come up with the money, there will be nowhere to go other than the workhouse—where she’ll be separated from her ailing mother and ten-year-old brother. Alex desperately wants to help Johanna, especially when she confides in him, but his mission—finding and bringing to justice a traitor to the crown—must come first, or they could all end up dead. There was so much to enjoy about this novel. Griep is always strong in her creation of male leads, and Alex is no exception. I enjoyed the way he and Joanna grew to know one another and their back-and-forth. She so desperately wanted to be strong, and he so desperately wanted to help her. They both had internal struggles they needed to walk through, and they did. I appreciably how Griep handled the themes in this story in organic ways. I also liked the unique secondary characters. While I struggled a tad in the middle which at times felt slow, overall this was another great read, and I'll happily pick up a Griep novel again! 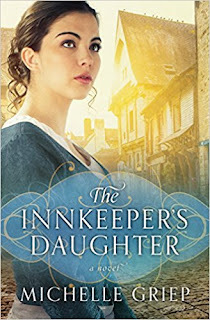 I give The Innkeeper's Daughter 4 out of 5 stars, and you can purchase it here.